PSI talks to Ian Zeff, Director of Cryptex Security (UK) in Barnet, who claims he can solve any problem his customers throw at him! 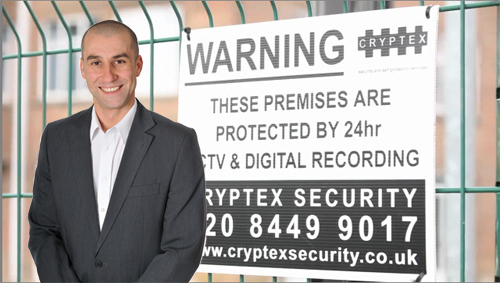 Ian has 23 years’ experience in the security industry and company areas of expertise include security systems, management and training. The company has SSAIB and other various awards and certifications. A combination of both. Over the years we have built some amazing relationships with manufacturers and supply chain distributors. We like to believe we work in partnership on both accounts and stay loyal, giving and gaining business for and from each other, and we’re equally reliant on delivery costs, lead times, credit terms availability and flexibility. This can only be done with someone, a company we trust – how the best business has always and will always be done! Is 3rd party accreditation beneficial to you? Third party accreditations are immeasurable in terms of how beneficial they are – each and every one can help offer the client independent peace of mind that we have achieved certain standards– it’s as simple as that. Accreditations like NSI, SSAIB etc. create a strong brand and guidance throughout the industry. Is there such a thing as a typical project – we like to think that no two are the same. We work in a range of sectors, from residential requirements for alarms, through CCTV and today visual verification through to education, health, retail and even places of worship. As opposed to the typical sector though, a project would include a premises that requires the full works – either a new or an upgraded security system, integration, maintenance and monitoring. This way, we get to build up a partnership approach with our clients, and they know they can rely on us 24 / 7 / 365, especially with our new alarm receiving and control centre services! Do you think there is a skills’ shortage in the industry? Any trouble recruiting installers? I think the skill requirements are changing in our industry as we work towards more visual verification, home automation and intelligent buildings. The type and level of workforce must be prepared to change to reflect this. Never has there been more truth in Charles Darwin’s infamous quote that it is not the strongest of the species that survives, nor the most intelligent. It is the one that is most adaptable to change. This is our challenge as an industry collectively. There is never a problem we cannot solve, and if we don’t have the solution, we always make recommendations to ensure the customer’s issues are responded to quickly and effectively. By example, we don’t offer keyholder services, and many of our new (and existing!) customers believe that it is a natural service for us to offer. However, what we do have a number of companies which we highly recommend and we are able to support keyholder services, so if there is a situation, we can be called to reset the alarm and ensure a property is safe and secure. Openly and honestly, the biggest myth is it works. You can have the most highfalutin system in the world, which may stop an opportunist, it may reduce the amount of time available in a property before the alarms are sounded, but it wouldn’t necessarily stop a determined criminal. This is why it’s critical to keep innovating in our industry so that new methods of prevention are launched, and until criminal masterminds manipulate them, will offer the latest source of security and ultimate peace of mind.